The 110-mile-long Lake Mead is remarkable. Study that word: “remarkable.” It means “deserving of remark.” And those remarks have historically included such terms as “spectacular,” “heroic,” and “unnatural.” In 1936 Lake Mead brought to the parched landscape southwest of Las Vegas an unbelievable promise of life and ease. Its collected waters–confined to provide essential moisture for every purpose, to drink, to irrigate, for recreation, and for the generation of electric power–are nothing short of an engineering miracle. 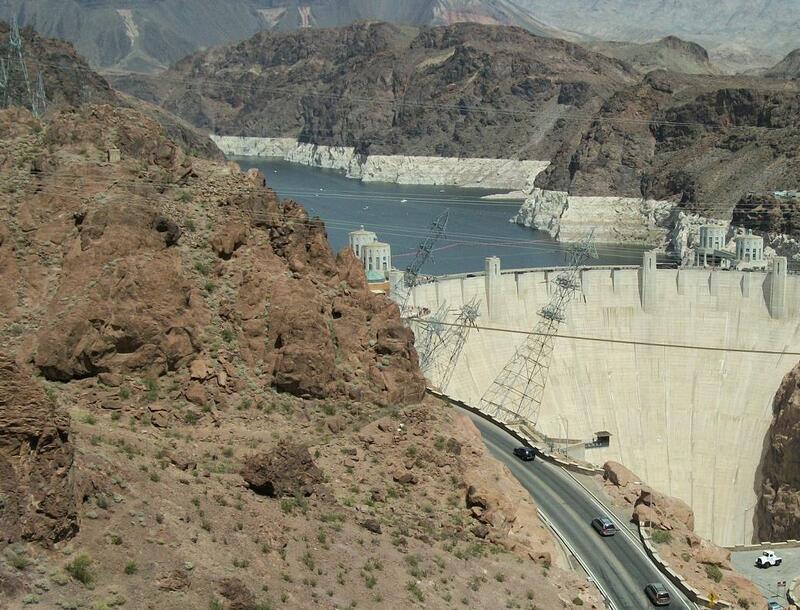 But in the spring of 2011 my one mournful remark on Lake Mead was simply “sad.” The nation’s largest fresh water reservoir was in the throes of a multi-year drought. Water levels were so low as to be painful to observe. On my visit to Lake Mead the reservoir was near its all time low level. All around this startling oasis in the Arizona-Nevada desert was a bathtub ring of despair–a discolored watermark of unfulfilled promise. As viewed here, from the vantage point of the new Colorado River Bridge at Black Canyon, you can see Hoover Dam and the stripe of failed ambitions. It was heartbreaking. Just four months before my April, 2011, visit the lake had reached an all time low water level, and at least one scientific research paper forecasts its demise as a relevant resource in the next ten years. These are the same waters of the mighty Colorado River that carved out The Grand Canyon and the lesser known but equally impressive Glenn Canyon farther north on the border with Utah. 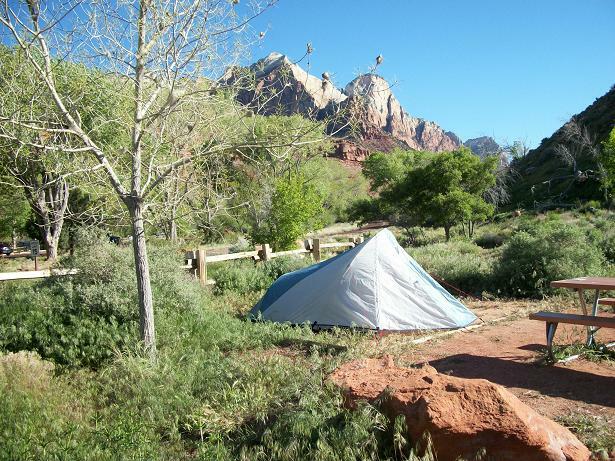 It had been my plan to camp here on the banks of Lake Mead on this first night of my ride to the north . But I found the place less than hospitable, even after the dry heat of Death Valley. I turned up the highway along the western shore of the lake and rode through hours of majestic desert scenery until the evening turned to twilight. I merged onto Interstate 15, and as the sun went down I found myself in Mesquite, Nevada, needing fuel, food, and a place to sleep. And this last-chance gambling mecca (before you cross the nearby border into Arizona) is a great place to find all three. For 29 bucks I got a great room in a mega-hotel-casino where I’m sure they thought I’d drop a bundle at the tables. Instead, I went out to Subway, grabbed a veggie-rich sub, and settled in to watch a little TV as my several electronic appliances sucked up a full electrical charge. The next morning, back on I-15, I crossed into Arizona (the extreme northwest corner) for all of thirty miles. And then I was in Utah. The spectacle and majesty of Utah’s several national parks had been a major motivation for this road trip. That in no way diminishes the unforgettable impressions I have of the attractions to the south, but after a lifetime of hearing the awed descriptions of Zion and Bryce Canyon and Arches and Canyonlands, I was eager for the destinations ahead. If you’ve spent much time scanning the pages of this memoir, you know that I’m seldom at a loss for words; pull my chain once, and I can flush for half an hour. And a lack of vocabulary isn’t the problem here, either. But I am truly unable to explain to you what felt so… different… unusual… fresh… about riding in Utah. I simply can’t describe the sense, the mood, the connection that set these roadways apart from the hundreds of miles that preceded them. One aspect I am able to identify. And it’s difficult to say it without sounding judgmental or accusatory, but I honestly don’t mean it as a negative about any other state. I only want to acknowledge a conspicuous positive about Utah. The state is unusually neat… tidy…and organized. In Utah I passed the same kind of ramshackle, dusty, and freelance farmsteads that I had seen in Colorado and New Mexico and Arizona and Nevada, but in this state the yards weren’t cluttered with derelict machinery or abandoned cars. That’s not to say they were landscaped or manicured, but a pride of ownership seemed to be at play along the hardscrabble driveways and behind the swayback fences. There was a change in the character of the rugged terrain, as well. Back in those other states, no matter how parched or barren the scenery, by riding forward I always felt that I was headed toward relief, a greener, happier place. Not so as I rode north into Utah; the crags and buttes and mesas that stood tall above the highway felt like statements of warning: Much more ahead… bigger, harder… mean. In the video I offer below, notice the towering menace that flanks both sides of Interstate 15 as I ride north toward Zion National Park. And notice, too, something I hadn’t seen before until this stretch of lonesome highway: the second truck that appears on the left–heading back south, the way I had come–is a FedEx rig with not one but three trailers in tow. When you finally arrive at the entrance to Zion National Park, it’s almost a letdown. After the winding, climbing ride past the colorful mountains that flank both the highways and the smaller approach roads, you might ask yourself, where’s the grandeur, the epic size, and scenic wonder? The unspectacular rock column marking the gate offers no hint of the stunning beauty and towering delights that await within. I got there in early afternoon, registered for my campsite, and quickly set up the home base for my ride of discovery. It was an overwhelming experience, a menace to safe riding as the eye was distracted time after time from the roadway to the spectacle above and all around the twisty mountain track. I should note that, though it isn’t seen in this video, the vehicular traffic on the narrow, winding, frequently tunneled roads of Zion was heavy in this first week of May. I can only presume that it gets even more hectic as the vacation season builds to a crescendo. And much of what is coming at you around those bends is wide and unwieldy, especially the tour buses and the rented campers, many of the latter operated by inexperienced and road-hungry holiday drivers who are unsuccessfully fighting the urge to gape at the scenery right along with their passengers. I was lucky enough to get one of the last available tent sites in the only campground that wasn’t full to capacity. I parked with the cars and other motorcycles in a large paved lot, then made several trips to carry in essential gear for my one night stay. And early the next morning, after a light, coffee laced breakfast, I was on my way again. My route took me through the park. The largest of the erosion carved amphitheaters in the park is twelve miles long and contains a dense forest of intricately shaped hoodoos up to 200 feet tall. I wasn’t able to get a close up look at the rock formations in the great amphitheaters of Bryce Canyon. There are no paved roads down in the depths, and the winding, sandy tracks that serve the tourist shuttles through the area are not motorcycle friendly. But I wasn’t disappointed. On my ride from Zion to Bryce I had traveled north on U.S. Route 89 and turned east on the two-lane Utah Route 12. Very shortly thereafter I was in Red Canyon, enjoying a ground level preview of what Bryce had to offer. 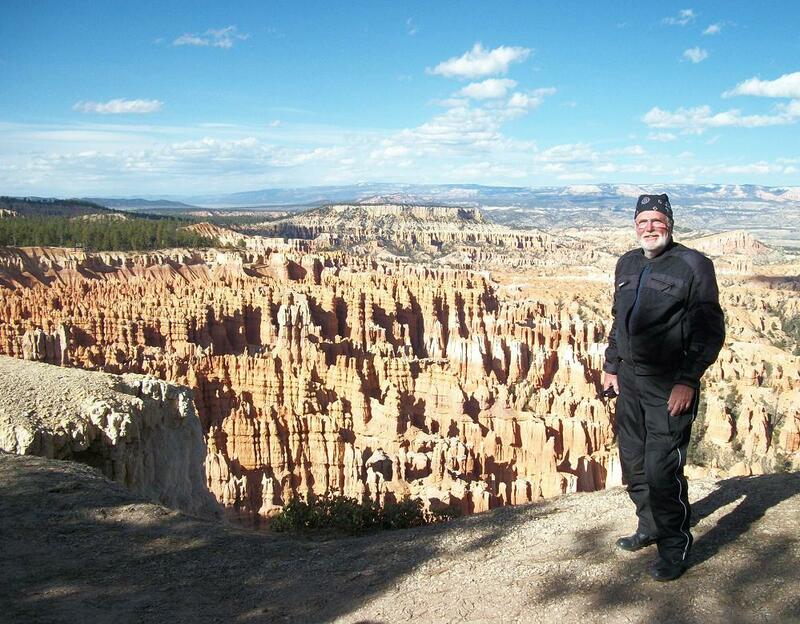 And when I left Bryce Canyon and returned to Route 12 to continue my ride east, I would be able to reach out and touch the faces of the hoodoos. A taste of the Red Canyon ride is in the video below. 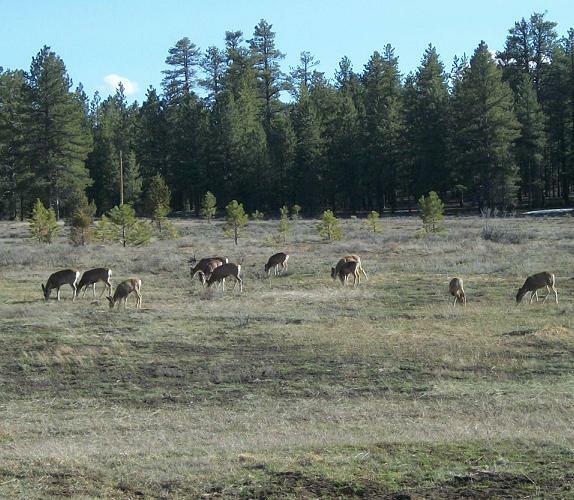 Here at Bryce Canyon and at Arches National Park I found the deer to be so accustomed to nearby humans. They hardly gave us a look. Not many tent campers joined me for the night at this higher, 9,000-foot, elevation. The camper trailer and RV populations were well represented, but I was one of the few to pass the cold (34-deegree) night sleeping on the ground. I rode out of Bryce under bright sunshine the following morning, passed a roadside herd of grazing deer, and set off to see still more of nature’s handiwork. I didn’t have long to wait, but nature suggested I take a short break from the camping scene. 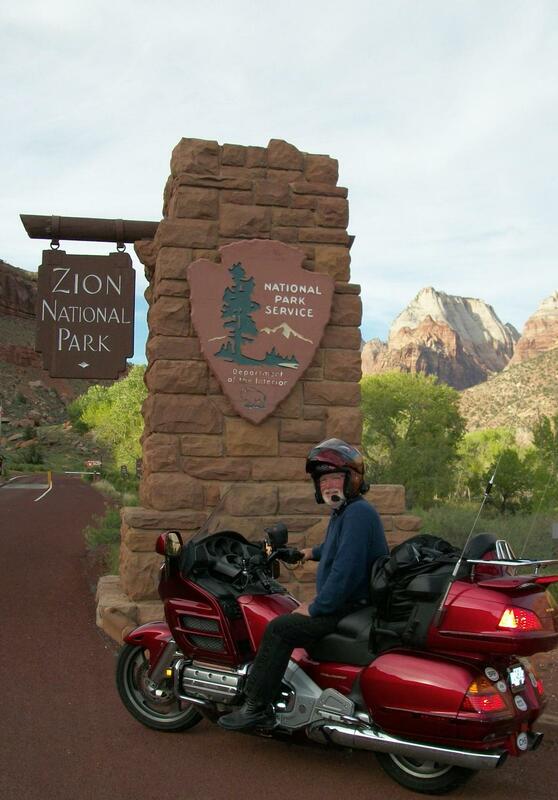 Following Route 12 east and north from Bryce was a lovely and peaceful ride. It was fifty miles to Escalante, the home of a nearby petrified forest site, and then another 65 miles to Torrey. Much of the ride was at elevations well above 9,000 feet, and a few times approached 10,000. At midday it was 36 degrees up here at 9400 ft. Notice that I’ve climbed above much of last night’s snowfall. On the higher flats, an overnight snowfall had left much of the countryside dusted in white, and despite the sunshine, the dry air had a sting and a bite to it. But the roads were clear, and visibility was unlimited. It was not far from the scene in this photograph that I experienced for the first time the unsettling phenomenon I call the “ridge road.” It’s a section of the highway where the steep falloff to the canyon below doesn’t occur on the right side of the bike or on the left side, but on both sides at simultaneously. I’ll have to ask you to accept my description of it because I wasn’t about to go back and ride the unnerving stretch again just get a picture of it. That lack of enthusiasm for the photographic arts was my first clue that I wasn’t feeling totally chipper and eager for the sights. By the time I reached Torrey I simply wanted to put myself somewhere warm and safe and blissfully civilized. I took a motel room for the night and was in bed with the television on as the sun went down. By three o’clock in the morning my head felt like an overinflated balloon, my sinuses ached and burned, and I couldn’t breathe well enough to sleep. I turned on the shower full hot and let it run until I could have steamed asparagus in the bathroom. I lowered the temperature until the water was just bearable and stood with it beating down on my face until my head was draining like a faucet. Warmly dressed and back in bed, I propped myself nearly upright on four pillows and eventually drifted back to sleep still sipping the only medication I had available… from those fine pharmacists at Cutty Sark. The following morning I was pleasantly surprised by the mildness of my symptoms. I had worried about having to take a lay day while the body tried to mend itself. Instead, I ate a hot, hearty breakfast and had the Goldwing loaded and road-ready before nine o’clock. Route 12 ends in Torrey, so I took the town’s only highway, Route 24, almost due east along the scenic perimeter of Capitol Reef National Park. You might think that by now, two weeks into this desert terrain, the eye and the spirit might be tiring of it. But that was not the case. Photographs of the landscape manage to capture more of its sometimes dreary sameness than they manage to portray of its frequently boundless variety, beauty, and inspiration. And hour after hour on the curling roadways that cross its uneven terrain brings an unexplainable kind of peace. The immensity of it instills a weird sort of confidence in the fact that it’s not suddenly going to end, to run out its last mile up against some factory or shopping mall. 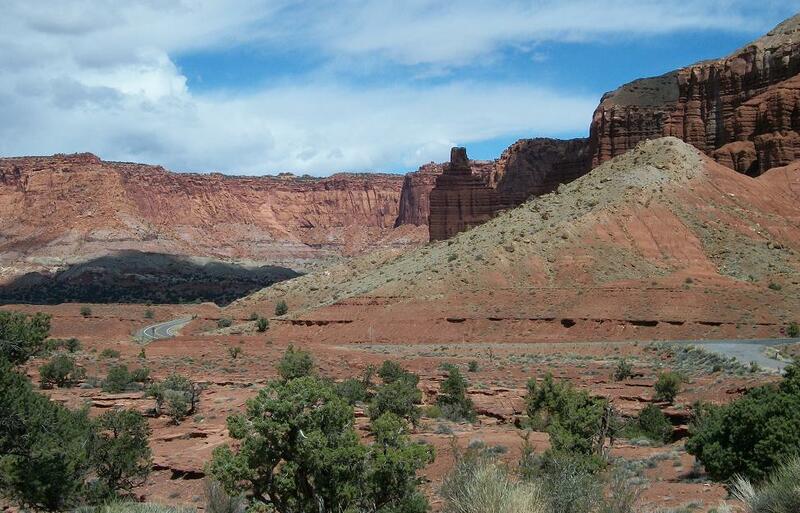 Capitol Reef National Park: You could begin to believe it goes on forever. Following Route 24 eastward along the meandering Fremont River, the elevation descends below 5,000 feet, the temperature rises into the fifties. After covering the sixty miles to Hanksville, I had planned to turn south for eighty miles and spend the night at Natural Bridges National Monument, but the health scare of the night before persuaded me that the thriving town of Moab would be a safer place than the desert wilderness to find myself as the sun went down… just in case my symptoms returned. Moab is the host community for the incomparable Arches National Park and was 110 miles away if I turned north rather than south. The distance was thirty miles longer, but coincidentally thirty miles of the run to Moab would be on Interstate 70. So I turned north; I’d spend the night at Arches. What I didn’t factor in while making my decision was the weather, and it did its best to make me regret my choice. Continuing along Route 24, which had now turned almost due north, I noticed that I was riding into a nasty-looking, grey-going-to-black sky with a familiar winter murkiness to it. A little over an hour later, the falling temperature added to my suspicions, and when the first snowflakes began to drift down on I-70 I started watching the roadsides for sanctuary. Highway signs promised a Super 8 and a Holiday Inn Express in the upcoming town of Green River, but my GPS promised a curve in the Interstate to the south and away from the approaching cold front. It would be a road race, but I needed only twenty miles on my new southerly vector before I reached the turnoff to Moab, and at that point my new course on US 191 would be due south, out of the snow. I wiped the accumulating white stuff off my helmet visor and hoped for the best. I rode past the entrance to Arches and on across the Colorado River to pick up some supplies and check the weather forecast from the secure confines of Moab. It’s a delightful little town, tending toward touristy, but preserving genuine hospitality and charm. I bought some decongestants and other amenities and stopped for a fast-food supper so I wouldn’t have to cook in camp. I called home with a status report and to get another dose of encouragement. While I was at it, I checked my email and posted a Facebook update to let friends know I was still safe. Experience had taught me to expect neither cell phone nor internet service in the campground. What I could count on in remote locations was the U.S. Weather Service Radio that my Goldwing is equipped with. The overnight forecast called for the snow to stay just north of I-70 or about fifty miles from my campsite, so I stowed my electronics and my new purchases and headed back to Arches. The end of this ride of a late-lifetime lies just three days ahead.